Cheap Slow Juicers - There Are Many Copycat Juicers, Should You Buy It? I’ve been an advocate of slow juicers for over a decade now. Since I first started drinking fresh juices extracted from a slow/masticating juicer a long time ago, I never went back to drinking juices extracted from a centrifugal juicer ever again. There are huge differences in juice quality and other factors between the two types of juicers. You can read about them here. With better education on the value and benefits of slow-juicing, the juicer industry is moving towards producing more and more new models of slow/masticating juicers. Recently, the market is being flooded with many new brands and models of juicers that it’s becoming difficult to keep up with what’s new and good. Almost every other day, I receive emails asking me if this or that juicer is a good buy. Many of them are brands and models that are unheard of, which is why this article is timely and important, if you’re looking to buy a juicer. Should You Buy These Cheap Slow Juicers? One of the first things I look for when looking to buy a juicer, is the brand. No, no, don’t get me wrong! I’m not “brand-conscious” for the sake of status. 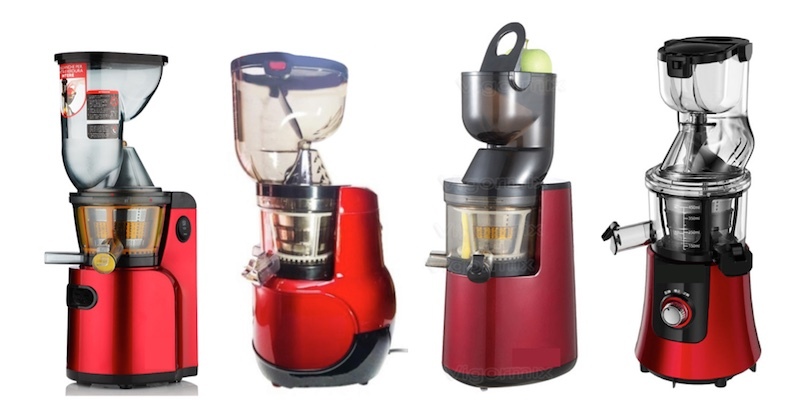 There are a few well-known juicer brands in the market of which quality and make are unquestionable, namely: Omega, Oscar, Samson Vitalmax, Hurom, Kuvings, Breville, Angel, Kempo etc. This page lists a number of my recommended juicers. If you are unsure, perhaps you could ask the seller, the country of manufacture of the juicer. If you have the juicer in your hand, you could turn it upside down where the serial number sticker is—there, you may see the famous “Made in China“. Put it back on the shelf, you don’t want to buy it. Poor quality materials: When you hold a cheap juicer in your hands, it is easy to tell that the material used to manufacture that juicer is of poor quality. You can feel that the juicer is made of cheap plastic (hey, there’s no guarantee if they are BPA-free!). Poor-fitting parts: Assemble the juicer and you may find that there are poor-fitting parts. They may be either too loose or too tight. Poor-fitting parts may cause leaks when in use, or the juicer may get clogged up or jammed/stuck. Low-quality body: The body of a cheap juicer will look cheap and light, because they are made of low-quality plastic and coated with paint. High quality juicers are built solid and heavy. Weak motor: High quality juicers use strong AC motors that are designed for durability and heavy duty use. The cheap, copycat juicers are not able to duplicate the quality as they need to keep the cost of their juicers very low. Cheap and weak motors have to work harder, and with extensive use (if you’re a regular juicer) the motor will soon burn out. A quality slow juicer should produce rich, concentrated juices with deep color and flavorful taste. The nutrients are still intact because of the method of extraction that doesn’t destroy the enzymes and nutrients. In fact, it may also minimize pesticides and chemicals in the juice! Juice yield: Quality juicers will provide high juice yield and almost dry pulp. With a low quality juicer, you may not extract such rich juices and may get lower juice yield. This may cost you more in the long run, for having to buy more produce and getting less juice. Juice may oxidize rapidly: I once did a test on a cheap slow juicer and found that the juice oxidized immediately upon extraction. I usually juice an apple as that’s the best way to test whether it’s a good juicer. The whole purpose of buying a slow juicer is to delay juice oxidation. If the juicer didn’t pass the test, send it back! I asked the manufacturer of a high quality juicer that I was working with at that time, and he told me this: The auger material, the length and diameter of the auger, all play a major role in preserving the freshness of the extracted juice. With a quality juicer, the manufacturer had spent a lot of time and money into perfecting the auger to ensure that the juicer produces only high quality and stable juices that can keep for longer without oxidizing (up to five days!). One of the best things I always like about the well-known brand juicers is the warranty. They usually come with at least a 10, 15 or 20-year warranty on the motor, depending on the brand/model. Manufacturers are so confident with their juicers that they are able to give that kind of warranty. In fact, with all the seven quality juicers I have (and used to have), I never once had to take them in for service. With proper care, these workhorses last forever! However, this is not the case with cheap quality juicers. They usually come with only one or two-year warranties, so beware! With vertical juicers, where the juicing screens have larger surfaces, they tend to be one of the parts that break. Again, with proper care, I have never ever experienced a broken juicing screen. If you had purchased a quality juicer, they most likely come with a warranty of between 2 and 5-year for a juicing screen replacement. Well, never so with a cheap juicer! In fact, you might not even be able to find replacement parts when you need them! By simply knowing the warranty period, you could even tell if the cheap juicer is worth buying. Why pay about $100 – $150 for a cheap juicer that may just break within a few months of juicing? Save and invest a little more for a quality juicer and you can be assured of safe and pleasurable juicing. For example, a Samson or an Omega J8003 may cost only a little more than $200! I emphasize a lot on safety and quality juicing on this site. I can’t stress enough—drinking oxidized juice is as good as drinking spoiled juice. Safety is not a priority with manufacturers of low-quality and cheap juicers. Their priority is profit, at your expense. So, should you buy that cheap juicer? You should have your answer by now. High quality juicers may be priced a little more, but for good reasons. Even the 10-25 year warranty alone is worth paying for, especially if you believe in juicing as a healthy addition to your lifestyle. Check out my ultimate guide on buying a juicer and the few quality juicers I recommend. Right on, I just used my brand new Green Star Elite. Juice was incredible, and its obvious that the quality, fit and finish of the parts are number one.